Physical characteristics: White-throated fantails have lengths that range from 6.9 to 8.1 inches (17.5 to 20.5 centimeters), with weights between 0.3 to 0.45 ounces (9 to 13 grams). They are primarily gray with a white throat, brow, and on the tip of their tail. Geographic range: White-throated fantails can be found throughout northeastern Pakistan, India, southeastern Tibet, southern China, Myanmar, Thailand, Peninsular Malaysia, Sumatra, Borneo, in the foothills and adjacent plains up to 10,000 feet (3,000 meters). Habitat: White-throated fantails generally prefer broad-leaved evergreen forests and are also comfortable living in areas that have been modified by humans, such as bamboo, in parks, secondary regrowth, and in wooded gardens. 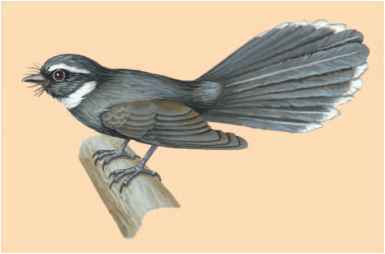 Diet: White-throated fantails are primarily insectivores, feeding along branches and also outside of foliage. They hunt for food either by themselves, in pairs, or in mixed hunting parties. Behavior and reproduction: White-tailed fantails are typical of other birds of the family. They continually fan their tail as a part of their restless, showy behavior. They live in the undergrowth and middle growth of the forest. In the winter they move from higher elevations to the foothills and plains below their habitat the rest of the year. Their song is made up of thin, high-pitched notes. The breeding season varies throughout the population distribution, averaging from February through May, to March through August. During the season up to two broods might be raised. Both males and females build the nest, and incubate the eggs that are spotted and in clutches of three eggs. The nest is cup-shaped, and made of fine grass stems held together by cobwebs around its exterior, with a dangling "tail" of grasses hanging underneath. 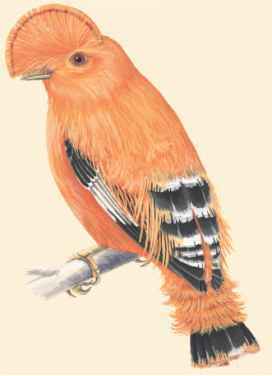 The incubation period is from twelve to thirteen days, with fledging, growing of flight feathers, occurring at thirteen to fifteen days. White-throated fantails and people: There is no special relationship between white-throated fantails and people.